The Kelly Slater Surf Park may be installed in touristic resorts or theme parks. A ticket for one hour of artificial surfing will cost you $45. Kelly Slater hasn't confirmed these informations that have been rumoured in the web. SurferToday.com is trying to get the exact information and correct all the details published by popsci.com. The technological design is quite simple. One hundred feet hydrofoils will rotate around the tank behind a protective fence. The wave height is adjustable - you can get three-to-eight wavebarrels for surfing joy. 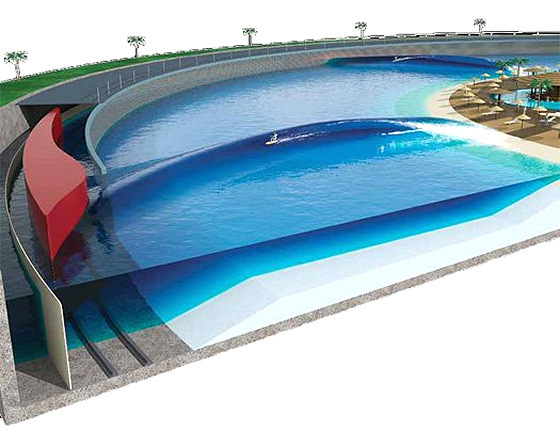 The Kelly Slater Surf Park will be really high tech. From the surf pool floor to the edges of the tank, everything was studied to get top artificial surfing performances. As you get closer to the center of the tanks, waves tend to be glassier and smoother. When you end up your carousel ride, you land in an artificial island beach.